On March 16th, CBC launched Keeping Canada Safe, a high-profile, eight-part documentary series featuring everyday heroes. Hamza Al-Baghdadi, one of our USGE members, was interviewed about his work as a Parole Officer. Find out why he thinks his work can be humbling, and more, in the article below. 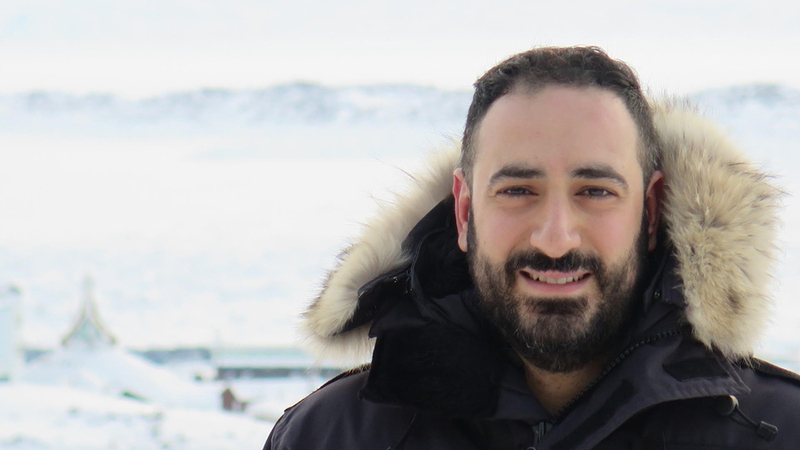 Hamza is the lone parole officer in one of Canada's most northerly regions. He went to Iqaluit for a four-month stint and, five years later, he’s still there and has no plans to leave. What personality traits are best suited to your job? Being an empathetic and compassionate listener is essential. To be successful in my job, I need to build a professional relationship with each offender and communicate with them in a way that they can relate to, without being judgmental. I also need to exercise sound professional judgment, and to understand the risk factors that contribute to each offender’s criminal behaviour. My first duty is to keep the public safe. My job requires me to work with many different people who may assist offenders in reintegrating into their communities — their families and friends, local service agencies, other support systems — so good communication skills are necessary. From a Nunavut perspective, being the lone Parole Officer at one of CSC’s most northern offices, in a territory that makes up one-fifth of Canada's landmass and spans three time zones, presents some unique challenges and opportunities. This is an isolated post. For instance, there are no roads connecting Nunavut to the rest of Canada, and accessibility is limited to aircraft or by boat in the late summer. So being able to work independently and with a high level of ingenuity is necessary. For me, the most important thing has been the network of friends I have made in the North over the years, people I could reach out to and rely upon during difficult times. Without these relationships, the isolation can easily get to you. "I get a strong sense of fulfillment when I see an offender under my care and supervision turn their lives around and become a productive member of society." Being a parole officer can sometimes be a thankless job. Put it this way, you don’t do this job for the paycheque, but rather you do so because you enjoy making a contribution to public safety and making a difference in the lives of others. I get a strong sense of fulfillment when I see an offender under my care and supervision turn their lives around and become a productive member of society. These success stories are what make it all worth it. On a personal level, my career with CSC has been a very humbling experience because it has given me considerable exposure to and helped me understand the many social issues and challenges faced by Canadians, particularly those living in Indigenous communities; issues that the average Canadian may not necessarily be aware of. Living in an isolated tight-knit community where everyone knows each other has forced me to get outside of my comfort zone and become more involved in the community (both in my professional and personal life), whether it be by opening our home to children in need of foster care, volunteering at the soup kitchen, or being a member of the local youth justice committee. Being involved in my community has given me the opportunity to make great friends and get to shape the direction in which our community is headed. In my opinion, when a community is doing well as a whole, we’re all better off. Nunavummiut understand that the wellbeing of our community is a shared responsibility and each and every one of us has a role to play. What is the biggest motivator for you? My firsthand experience with the consequences of poverty and homelessness is what has driven my passion and motivation to assist marginalized and stigmatized populations through my work in the area of offender reintegration. Second chances are important, and I firmly believe that people have the capacity to change, no matter what mistakes they have made in the past. I have witnessed this first-hand with some of the offenders I have supervised over the course of my career. I had been supervising an elderly Inuk offender originally from the western Arctic. He was conditionally released to Iqaluit because he was banished by his family and community from returning home as a result of his offence. Over the course of his supervisions in Iqaluit, I reached out to his family and home community in an effort to seek reconciliation with the offender. After 10 months of back and forth dialogue with his family, and local treatment and service providers, a plan for the offender’s return and integration back to his community was proposed. The offender’s family and the community were involved in the release planning process and agreed to absolve his banishment and work closely with me in supporting his transition home. What seemed impossible became possible through the compassion and resilience displayed by the offender’s family and his community. Not only did the community forgive him, they accepted him back into the community with open arms by holding a feast to welcome him home. A few months later, the offender wrote to me and expressed his appreciation to everyone who helped him pave the road towards his successful reintegration back into his community. This experience is a testament to the strength, resilience, and compassion within Aboriginal communities. Receiving that letter made my day as it isn’t very often that an offender thanks us for all we do. What was your hardest day on the job? My toughest day on the job was when an inmate at one of our institutions committed suicide one evening and I was asked to assist in completing the Next of Kin (NOK) notification with his family in Iqaluit. The institution was having trouble reaching the inmate’s NOK since the family did not have a phone. In a small town where everyone knows each other, combined with my personal knowledge of the NOK, as I'd had previous interactions with the NOK here in the community, I was able to find her and personally attend her home to deliver the bad news. The family was obviously devastated and became visibly emotional. However, because I was a familiar face to them, that made it easier for both the family and me to handle this stressful time. What are the most important lessons you’ve learned by doing this work? It is not my role to judge an offender; the courts have already done so. My job is to maintain objectivity and professional integrity no matter how heinous the crime in order to ensure that decisions being made that impact an offender are fair. Naturally, I’m only human and it is inevitable that personal biases or negative emotions can arise in response to a client’s offending behaviour, but it’s key for me to keep these emotions in check and assess and recommend. At the end of the day, my assessments and recommendations need to be based on risk rather than personal biases. My goal is to help the men and women under my care and supervision get their lives back on track no matter the crime. This is essential to public safety, since most federal offenders will inevitably be released back into the community. Every offender has unique needs, and I work intensively with them and their social supports to build a solid release plan. If an offender gets sent back to prison, I feel I’ve failed — their success is my success. The proudest moment in my career was being awarded CSC’s Multiculturalism Award for promoting initiatives that support CSC and the successful reintegration of offenders belonging to ethno-cultural minority groups. The award recognized my efforts in organizing events that would educate CSC staff about their communities, in order to assist them in becoming more culturally competent. Do your co-workers have a nickname for you? How did you earn it? I guess I have two nicknames. The first one is Jimmy. I was on my first assignment as a Parole Officer in Toronto, and my supervisor and I attended the home of an offender’s father in order to complete a community assessment. I introduced myself to the elderly man, who had a strong Scottish accent and was also hard of hearing. He struggled to pronounce my name correctly and, after several attempts, gave up and stated that he would just refer to me as “Jimmy.” While this was somewhat an ignorant thing to say, we couldn’t help but laugh at the absurdity of the situation. This nickname has stuck with me ever since. My other nickname at work is Hamza of the North, or HON for short. My boss came up with it as he did not expect me to live in Iqaluit for as long as I have and make Nunavut my home. I was originally sent to Iqaluit on a four-month assignment, but I am still up here almost five years later, and I have no plans to move back south in the foreseeable future. "If an offender gets sent back to prison, I feel I’ve failed—their success is my success." What advice would you give to someone just starting out in this job? As community parole officers, we encounter lots of challenging situations, hostile situations may arise, given offenders are often required to report to their parole officer against their will. New PO’s may experience frustration if their offender continues to make poor choices and fails to abide by the terms and conditions of their release. We are also exposed to discouraging situations, particularly when children are involved in the lives of our offenders. With that said, it is important that parole officers keep their work and personal lives separate. Another piece of advice for new officers is to maintain a work/life balance in order to avoid compassion fatigue, vicarious trauma, and burnout. This type of work definitely exacts a toll in job-related stress. As a parole officer, you’re always going to be busy as crime doesn’t take a break. Take care of yourself first and foremost. When faced with a difficult situation or negative emotions, talk to your supports whether it is your colleagues at work, friends, or family members. Don't be afraid to start a conversation about mental health, and don’t be worried about being seen as weak if you disclose a problem, you’re not! We are all in this together and have a collective responsibility to look out for and take care of one another. Who is/was your biggest inspiration in life? My parents. They immigrated to Canada when I was seven years old in search of a better life for themselves and their children. It wasn’t easy. My father had a Master’s degree, but it took him 6 years to find a job in his field, so he drove cab to provide for his family. I can’t even begin to imagine what my life would have been like had they not had the foresight to move here, particularly in view of the many conflicts that are currently plaguing the Middle East. And while those who are coming here today may experience different challenges than the ones my parents and I faced, I can empathize with their struggles and search for a better life. Just for fun: What’s your favourite book or movie? Why? Similarly, we as a society have a collective responsibility to support offenders in their transition back into the community. After all, offenders could be our future neighbours, local grocers, mechanics etc. They are people just like you and me. If we want them to be successful upon their release, we need to be mindful of their dignity as fellow human beings.